Though snakes don't use their teeth for chewing, they do need them to capture food and defend themselves. Each species has evolved teeth that are fine-tuned to its lifestyle. Some species have simple, undifferentiated teeth, while others have specialized venom-delivering teeth, called fangs. Regardless of their form or function, snakes replace their teeth regularly to ensure that they are always ready to capture prey. Though the terms are often used interchangeably, "teeth" and "fangs" refer to different things. While all the exposed bony surfaces in a snake's mouth are teeth, only those teeth that inject venom are fangs. In other words, all fangs are teeth, but not all teeth are fangs. Snakes replace all their teeth -- including their fangs -- often. Teeth regularly break, wear out or become stuck in prey. 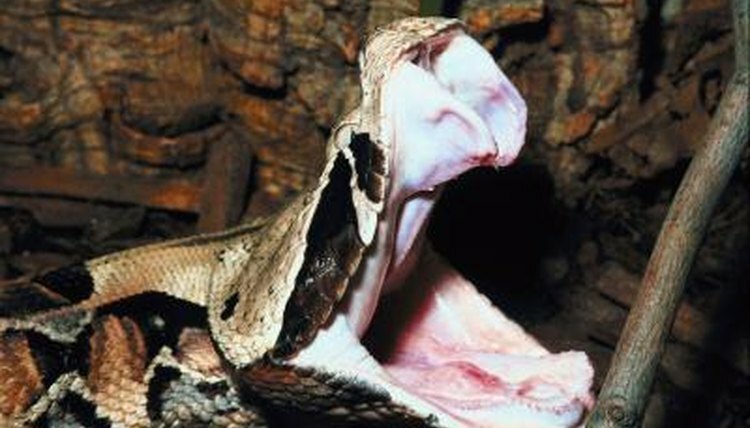 Some snakes, for example puff adders (Bitis arietans), have up to 6 replacement fangs, in various states of development, embedded in the gum tissue behind each of the active fangs. Occasionally a replacement fang pops into place before the old fang falls out, so a snake can temporarily have three fangs -- one on one side and two on the other. This is no problem for the snake; they can still bite and inject venom very efficiently. Herpetologists classify snakes in four primary groups according to the type of fangs they possess. Snakes without venom-injecting teeth of any kind are called aglyphous; they have varying amounts of teeth, but none modified for envenomation. Opisthoglyphous snakes are often colloquially called “rear-fanged” snakes, as their fangs reside at the rear of the maxilla, right below the eyes. Most opisthoglyphous snake fangs have a groove or channel down which venom flows into a wound. Proteroglyphous snakes have relatively small, hollow fangs at the very front of their mouths, which transmit venom directly into the body of their prey. Finally, solenoglyphous snakes have hollow fangs that are so large they must fold flat against the roof of the snakes’ mouths to allow the snakes to close their mouths properly. Sometimes keepers find shed teeth or fangs in their snake’s waste. This happens because teeth and fangs can become stuck in their prey. While the prey is largely digested, the teeth pass through the digestive system relatively unharmed. Because small snakes have very small teeth, you are more likely to find teeth in the feces of large snakes.